One of the most important aspects of your pronunciation is the way you use thought groups and focus within thought groups. If you are unable to deliver spoken English thought group patterns like a native English speaker, your colleagues or the students you assist may become tired, irritated, or unable to concentrate. If you can develop native speaker-like thought groups, you will be better understood by everybody and your students will be able to respond positively to the content of what you are teaching instead of becoming distracted by inappropriate English discourse intonation elements. What is a thought group? A thought group is a group of approximately two to five words that form a unit of meaning. 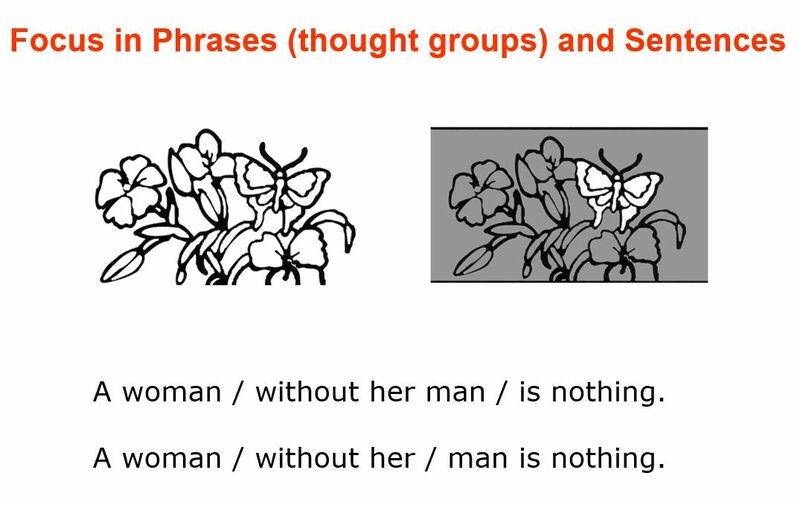 A thought group could also be called a phrase. The following sentence has three thought groups: The English language / uses thought groups / for clear communication. Phrasal stress or focus is the stressing of one syllable in a thought group and the lessening of stress in all other syllables in the group. How is stress created? By lengthening the stressed syllable, pronouncing it clearly, and using a pitch jump on the stressed syllable. The syllable that receives phrasal stress is usually the syllable with primary stress in the last stressed word in the thought group: ToDAY/ we will disCUSS / endothermic reACTions. Remember that, while a thought group may have other stressed syllables, there is only ONE focus word per thought group. A thought group has only ONE focus word. There are three thought groups in both sentences. Where is the focus in each thought group? Practice: Read these excerpts from President Obama's State of the Union Address January 12, 2016, with good phrase stress in thought groups. THAT'S / the AMERica / I KNOW. THAT'S / the COUNtry / we LOVE. CLEAR-eyed. BIG-hearted. OptiMIStic / that unarmed TRUTH / and unconditional LOVE / will have the final WORD. Thats what makes me so HOPEful / about our FUture. Because of YOU. I beLIEVE in you. Thats why I stand here CONfident / that the State of our UNION / is STRONG. FIRST / how do we give EVERYone / a fair SHOT / at opportunity and seCURity / in this new eCONomy? SEcond / how do we make technology work FOR us, and not aGAINST us? / especially when it comes to solving urgent CHALlenges / like CLImate change? THIRD, how do we keep America SAFE / and lead the WORLD / without becoming its poLICEman? And FINally, how can we make our politics reFLECT whats BEST in us / and not whats WORST?